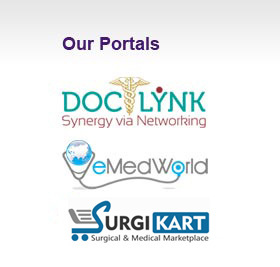 Medigrity comprises of three internet based application portals – DocLynk.com, eMedWorld.com and SurgiKart.com – each aimed at enriching the medical community, taking advantage of the latest technological trends. DocLynk.com is a state-of-the-art internet based free, safe and secured professional networking platform that helps the medical practitioners (Doctors and Dentists) and medical students to connect, collaborate and share knowledge. eMedWorld.com is a medical portal that helps patients and medical service seekers find the best of Healthcare providers and to make informed decisions. DocLynk.com and eMedWorld.com are designed to complement each other. SurgiKart.com helps Healthcare providers and other medical related businesses and consumers in procuring their Medical and Surgical equipments / components in the most cost-effective manner.